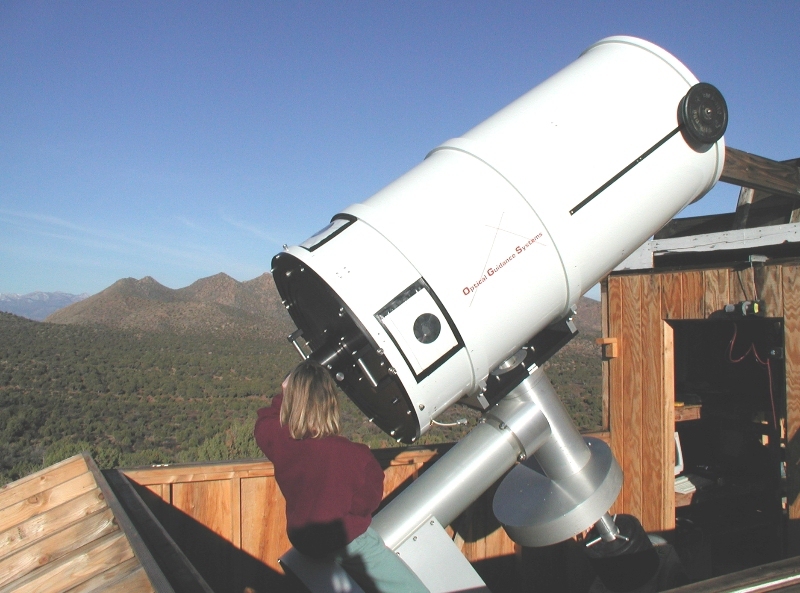 This is an early photograph taken soon after installation of the telescope in February of 2001. Occasional astronomer Eileen Misti is sitting on the polar axis "bronco style" to give scale to the photo. The "barbell" type weight attached to the optical tube was to compensate for an early imbalance problem which has since been resolved. The black rectangles at the mirror end of the optical tube were attaching plastic sheeting over the mirror fan openings to protect against a since-corrected leaky roof. A portion of one of the fold-down walls can be seen behind Eileen. The 14' wind-screen had not yet been constructed. The observatory was originally built to house my Meade 178ED 7" refractor. The dimensions of the observatory half of the building are 10' by 12'. This makes a very tight fit for the 32" telescope, but it does fit with "inches" to spare on all sides when in stowed position.